If you live in the Hamilton area and are looking for premium motorcycle service in Hamilton, be sure to visit our Budds’ Motorrad dealership in Oakville. Whether you have a simple question about how to best service your vehicle, or you need motorcycle service for your new or pre-owned vehicle in Hamilton, feel free to book an appointment online or call us at our Oakville dealership. Canadians are becoming more and more aware of the impact that our vehicles make on the health of the environment. At Budds’ Motorrad, we are continually striving to provide residents of Hamilton and the GTA with sustainable, fuel-efficient, and top quality motorcycles. The majority of the bikes that we have built in the last 30 years are still on the road today. At Budds’ Motorrad in Oakville, we thoroughly inspect all vehicles before they enter and leave our showroom. Our team of leading engineers knows exactly what it takes to create a vehicle that will withstand wear and tear, changing seasons, and still perform as if it’s brand new. In addition, we are proud to supply the community of Hamilton with motorcycles that have been manufactured in the most environmentally friendly way possible. For example, all paints used on our premium BMW motorcycles are water-based, and up to 95 per cent of each motorcycle’s parts can be recycled. Sustainability is the key to future development of the motorcycle. At our Oakville BMW Motoradd dealership, we understand and value the importance of sustaining the health of the environment while you get maximum enjoyment and longevity out of your BMW motorcycle. Be sure to visit our Oakville dealership when looking for motorcycle service in the Hamilton area, as we are here to help you achieve a long lasting driving experience on one of the world’s leading driving machines. Sustainability is part of what defines a premium brand, and that is why it is one of the corporate objectives of BMW Motorrad. Our long-term success is directly linked with providing our clients with motorcycles that not only look and feel amazing, but that will last for years to come. Whether you’re in the Oakville area and you want to stop in at our Budds’ Motorrad dealership or you’re in the comfort of your home in Hamilton, feel free to connect with us. Our user and mobile-friendly website makes it easy to book your motorcycle service appointment from Hamilton. Simply select the Service menu on our website in order to book an appointment today. Or, feel free to call our Oakville dealership to book your motorcycle service appointment with one of our friendly client representatives. 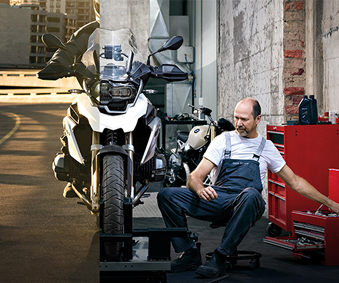 No matter what your needs are for your premium BMW motorcycle, at Budds’ Motorrad in Oakville, we do our best to provide you and your vehicle with excellent service.